The truth is that Eddie came from money. His father was a successful business man who funded his early career completely. That's perhaps something he didn't want to bring forward, he seemed quite proud of his wheeler dealing in his younger years? From my understanding, he was working at his dad's scrapyard for free. In return, his dad funded his first Formula Ford career. This was to keep him away from motorbikes that his parents viewed as much more dangerous. His personal fortune though, really took off from investing his F1 salaries. Really derailed this one I'm afraid, all my fault. Exactly. Doesn't always have the best package but can win. One of the main reasons why he nailed it this season is because he's made few mistakes compared to his main rival. You look at RBR.. most of this season they have been miles behind but a big portion of it is their sheer unreliability issues and constant penalties.. There are always those who want to take away what Lewis and Merc have achieved though. That's the major sad part. I remember at the start of the season and again last year when Ferrari were hammering the results. People questioned Lewis and his personal life. Fans claimed he wasn't bothered about F1 anymore. Pundits questioned his effort levels. Now? he's walked away with title number 5 at a time when it wasn't Merc V Merc. It was Merc V Ferrari with a few pokes from RBR. Lewis is closer to Schumachers number of total wins than Vettel is to Hamiltons. Other interesting facts from this year, Hamilton qualified on pole at Silverstone 0.044s faster than Vettel, also in Brazil Verstappen crashed with Ocon on lap 44 giving Hamilton the win. I really do wonder how long he will continue to dominate. We all know that in F1, no matter how good a driver is, he must have a competitive car to win titles. With Mercedes, it's kind of hard to imagine them not producing a competitive car. They won't always be the best but the way the team functions, it's hard to see Lewis finding himself in a car that's a second off the pace at any point. Mercedes have the largest budget and the only team that seem to match or surpass them in efficacy are Red Bull (a non-engine manufacturer). We all talk about the next two years but I see no reason why Lewis can't keep going for 5+ more years and be competitive throughout. It’s not impossible that Honda really turn things around next year and propel Redbull right to the front and with their chassis they could put up a challenge. Redbull have been very optimistic about their chances with next year’s new front wing. Also if Ferrari can improve at the same rate as they did the last 2 years they could find themselves with a dominant car. The only question would be wether Vettel and Leclerc trip over each other. Of course both of these things could happen and Mercedes find themselves as the 3rd best car.? There is indeed a very high chance that Mercedes and Hamilton could be challenged very hard next year and find poles and wins hard to come by. On the other hand though if Mercedes can maintain the same level of competitiveness with the new front wing Lewis could be looking at racking up at least 10 wins each season for the next 2 years, and with those numbers championships usually follow as well. By the end of 2020 we could be looking at Hamilton having just equaled Michael Schumacher on 7 Championships and probably surpassed the record for most wins. If he does that I see Hamilton extending his stay in F1 for at least another year just to see if he could get an 8th Championship and leave F1 with his legacy in no doubt. Hamilton now holds the record for most number of points in a season with 408! I wonder if he'll ever get the wins in a season record. He'd need 13 to tie it. He's had a tremendous run of winning double-digit races in 4 of the last 5 years but hasn't taken that record yet. With Mercedes no longer being dominant these last couple of years, that might be one he doesn't get. That said, if Mercedes can produce a dominant machine and if Bottas is his teammate, I think he will break that one. Honda engines are still blowing up the most out of all the other manufacturers though. I personally was encouraged by their mid season progress, but by now they should have been more solid in my opinion if they are to be a factor in 2019. Next year they are going to perform on the big stage, and I just don't feel they are ready for it. I don't see it, but think there are fair chances for him to reach 7 WDC's and 92+ race wins. The trend of Ferrari suggests continued fierce competition, and I think failure is not an option for RBR + Honda. Fireworks incoming from 2019-2020 is my prediction. It's a sound prediction. I can definitely see a strong possibility of having 2012-like seasons these next two years. Of course it's also possible that one team will surge ahead and dominate. Time will tell. Yeah I don't see Hamilton breaking the wins in a season record as I don't see Merc (or any other team for that matter) producing a car dominant enough to do that. A Merc advantage 2014-16 with Bottas in the other car would give him a great chance though. Wouldn't be surprised whichever of the front three are on top next season. It could be a cracker. Lewis must be worn out from not having his usual end of season holiday! He clinched in Mexico and promptly won both of the next two races. Might have tried to gift the win to Valtteri today, but Bottas was nowhere around to receive it. Looks like Lewis might have to be fast out of the box next year to stay at the top of the heap. Ferrari and RBR look to be more of a credible threat next year than they have been for a number of years. I would be more than happy if he just wins 10 races in 2019 and 10 races in 2020. Pretty cool to see this between Hamilton and Vettel after a championship battle. Nostalgia might be getting the best out of me lately but I do miss the wonder kid which entered the scene of Formula 1 in 2007 from time to time. I know he is still there doing great,wrapping world titles,race wins ,breaking new records but Lewis from the early days was the most entertaining Lewis to watch on board for me. 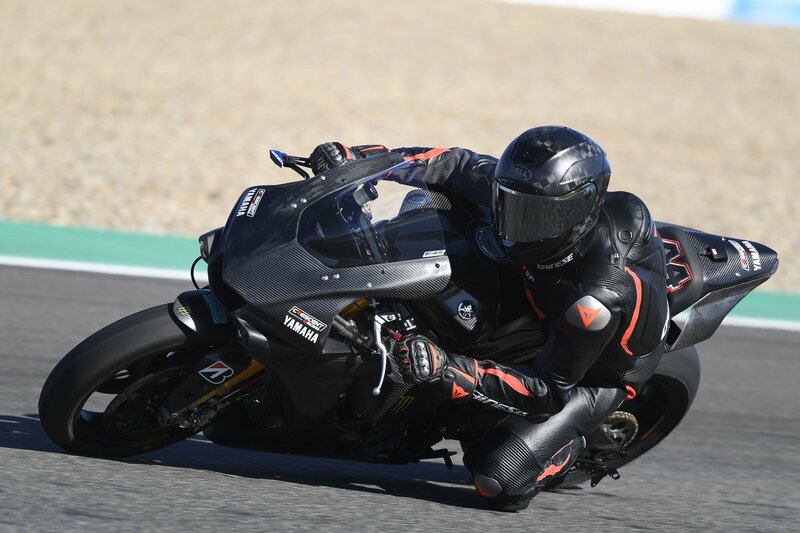 Lewis spent the day at Jerez riding a World Superbike Yamaha. He dropped the bike at one point when pushing the limits but got up and finished the day uninjured. Note the number 44 on the bum pad. Would love to see Lewis and Valentino Rossi or Mark Marquez do a ride swap. Lewis' buddy Cal Crutchlow would also be a good candidate. Would be fun to see a current MotoGP racer in an F1 Mercedes even if it is a several year old car. Agree with that MC, love the fact that LH dropped the bike going for it, says a lot about his state of mind, thats a great pic as well. I have to agree with Lewis. Something about 2 wheels is so much more fun than 4. I only have a boring road car but my R6 never fails to put a grin on my face. Though I came off a lot worse than him when i dropped mine! Did it put a grin on your face then too? Seriously I hope you weren't injured or anything like that! If you wanting to be a 7 times F1 WDC then you shouldn't be pushing the limit on a motor bike. I got high-sided and broke my arm, wrist and fractured my elbow! Joke was it was only at about ~20-30mph I was more worried about my bike as she lay in the road spilling oil everywhere as I cracked the stator cover. She and I are all fixed now and on best of terms with each other. 8 weeks later once I was out of my cast I had her fixed and was riding it again right away. Broken bones can't keep me away from that Inline 6 goodness. Closest I'll ever get to a screaming F1 car. Well the possibility for serious injury is always there in racing or testing outside Formula One. I would hate to see those possibilities contractually eliminated. Yes we lost Jim Clark to a F2 crash and Robert Kubica lost a large chunk of his career and almost his life to a Rally crash, but I have always found interdisciplinary racing a great way to measure the greatness of racing drivers and their skill levels. Yes, there are dangers in riding GP bikes at the limit, but it is a lot safer than what the general population thinks. Having worked as a turn marshal for a number of motorcycle road race events I have seen quite a few get offs where rider sustains little or no injury. Certainly during the season, Mercedes will limit what activities Lewis can participate in. In the off season with three months to recover, give him a little room to enjoy himself. Ultimately though taking part in something that is actually more dangerous than F1 itself is questionable and perfectly fine until it isn't. I know what you mean, I've driven an R6 once, great fun! Glad you're ok now. After four days of testing he's only 7s off the pace. Where do you guys think Hamilton will win his next races? MON, then AUT, then GBR. 4 wins from the first 10 races. Why Monaco? For me that’s least likely win of the first 10. Mercedes isn’t that good around Monaco and it isn’t a strong circuit for Hamilton either. China or Canada is much more likely. China with that looooong straight? I don’t think so. Unless it’s another ‘lucky’ win. Ferrari just have got too much grunt for Merc it seems. Their best hope is that they find something for their spec 2 engine to bridge the gap and that is not remotely easy without sacrificing reliability. Their best hope is that The Ferrari is fairly fragile and Vettel and Leclerc take points off of each other. The GPS data is pointing towards Ferrari's advantage being mainly on the straights, while Mercedes are stronger in the corners. Red Bull are not looking on the same level and Verstappen has a tendency to crash in Monaco so I would put Hamilton favourite for that race at the moment. I agree that Hamilton's record at Monaco isn't great, surprising given how much he says he loves the track. Maybe the worse track for him not maximising his win potential? His 2008 and 2016 wins were both fairly lucky, so these things even out in the end. His qualifying record around Monaco (compared to his teammate) is nowhere near as good as it is around other circuits. Also true about qualifying, half the time he manages to run into an issue, some self inflicted, all things being equal though given fair chance I think he would have had pole in 2007 and 2014.